For the second time this week, a University of Wisconsin Oshkosh employee has lost a legal fight over keeping investigative records under wraps. 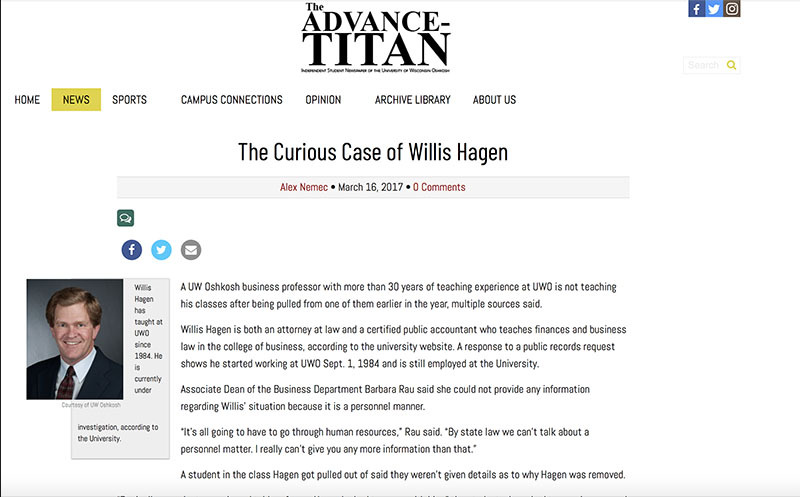 In a decision released Wednesday morning, the Wisconsin Court of Appeals said that the university was correct in agreeing to release records relating to business professor Willis W. Hagen II. Hagen had been the subject of a March 2017 article in the campus newspaper, The Advance-Titan, regarding his removal from teaching in the spring semester of that year. 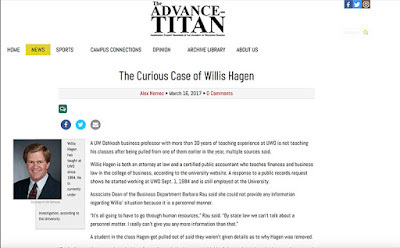 When the newspaper filed a public records request for the results of an investigation into Hagen, the university agreed to disclose a variety of documents. These included “notices of a complaint and related investigation; a summary of a meeting about that investigation; the resulting report on the complaint, investigation, and findings; the complaint itself; responses by Hagen to the complaint and findings; and recommendations and sanctions stemming from the investigation,” the appeals court said. Some “emails regarding the complaint and investigation” are also at issue. Hagen filed suit in Winnebago County to keep the records out of the public eye, but his request was not granted. Hagen appealed that ruling in October. The judge hearing Hagen’s initial lawsuit, Daniel J. Bissett, is the same judge who on Monday ruled that the university acted properly in agreeing to release the records of an investigation into alleged sexual harassment by former UW Oshkosh volleyball coach Brian Schaefer. One of the arguments that Hagen made was that disclosure of disciplinary actions against professors would make it harder for the university to attract qualified workers. But the appeals court rejected this notion. “Releasing records relating to misconduct investigations is unlikely to discourage recruitment of good teachers,” it said. “Indeed, it is as likely that current or prospective employees would view the release as appropriately transparent and favoring accountability." Hagen’s records will remain under seal for at least 30 days, to give him a chance to ask for reconsideration or for review by the Wisconsin Supreme Court. "I’m thrilled that the court decided to affirm the case and rule in my favor," said Alex Nemec, a former news editor for the Advance-Titan, who filed the open records request. "I’m eager to see what these records hold and finally get around to finding out the truth of what happened last year when I first reported on it." "Today’s ruling affirms the importance of public oversight of and access to information about public universities, which is of particular importance to student journalists who monitor these institutions," said Christa Westerberg, the attorney who represented Nemec. "The decision is also important for rejecting speculative arguments that employee recruiting may be affected by releasing records of closed investigations, and for actually pointing out the reverse," she added. Neither Hagen or his attorney had an immediate response to a request for comment. The unanimous decision against Hagen was signed by Chief Judge Lisa S. Neubauer. She was joined by Judges Paul F. Reilly and Brian K. Hagedorn.